Science is not always predictable. On the JR challenges and solutions are part of the daily experience. Throughout Expedition 340 challenges have arisen as part of the exploration of drilling in new locations along the seafloor. Even after much preliminary data is gathered and interpreted (seismic profiles, shallow cores) until the drilling begins we are not 100% sure what to expect. This is part of the excitement of ‘doing exploratory science’ and much of the excitement for 340 scientists as they ‘see’ the cores for the first time as each arrives from the seafloor. Below is a pictorial summary of some of the challenges encountered and surmounted during Expedition 340. This is one of the many things that make extraordinary science aboard the JR possible— because of the talented people aboard who are able to problem solve and find solutions along the way the drilling operations keep going. All in a day’s work aboard the JR as 340 science objectives are pursued. Our 1st sampling site was U1393 (CARI-02). Recovery at this site was low and challenging as we were sampling in very young rock. While only seven cores were retrieved with ~5 meters of material from the seafloor recovered, Expedition 340 was one of the first to recover at least some material from a young debris flow. “Young rock was crumbly and did not maintain integrity under the pressure of the drill bit.” (Face Book post, Osamu Ishizuka, 340 Co-Chief). This site was discontinued when we lost a core barrel in the hole. The JR moved to 2nd sampling site U1394 (CARI-03). After recovering 27 cores from Hole A the hole collapsed while drilling. Explosives were needed to release the Bottom Hole Assembly (BHA) from the core pipe. Then, the JR moved 20 meters to drill Hole B where 21 additional cores were retrieved and 141 meters of material recovered. Once again, the science continues because of the talented Operations &Technical staff aboard JR.
After retrieving 53 cores from sampling site U1395 (CARI-04) attempted to take a temperature measurement on top of the Core. The SET tool was being tested for the first time after engineering during Expedition 340. This is part of the everyday for engineers aboard the JR as they are refurbishing and testing instrumentation. 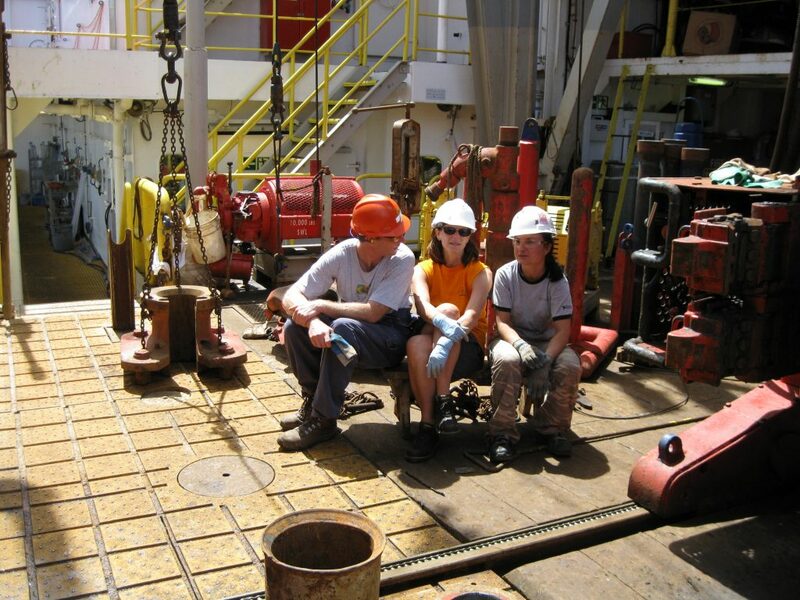 During ocean drilling, expeditions utilize lots of expendable supplies. Like the photo above shows, ‘Getting the most out of your XCB cutting shoe’. This is a before and after of XCBs. The XCB is the extended coring barrel that cuts into the ocean floor. At sampling site U1399 (CARI-08) Hole B 180 meters of successful coring into the formation was completed. While we were only 40 m short of our depth objectives the Hole was abandoned because of poor recovery and the Core pipe kept getting stuck during drilling. This did not make it a favorable hole to conduct downhole logging… so the JR moved to within 40 meters of Hole A and drilled a 3rd Hole C for downhole logging. Once again with planning (…for lots of XCBs) and problem solving scientific objectives were met. We are currently at site U1400 (CARI-07) and have cored to 210 meters with 100% recovery of material. Drilling was delayed when the Core barrel stuck to the Bottom Hole Assembly (BHA). The BHA hangs below the drill pipe and provides weight to the drill or core bit. For expedition 340 we are using APC followed by XCB bits (left side of diagram above). Several attempts were made to free the Core barrel, however everything in the water had to be brought to the surface and drilling in Hole B was abandoned. The JR moved 20 meters and the outstanding drill team assembled the drill string for new Hole C. We have successfully recovered 43 cores so far, with the goal of drilling 420 meters below seafloor. Science continues thanks to the JR engineers and drill team!